Well there are still a couple of states to do in the North-East, if I am to make this comprehensive, before I turn around and look elsewhere. So I am going to do New Hampshire today. It has only 5 USHCN stations and 1 GISS station at Concord, which has a record since 1880. (And I updated the bottom of this post on Sunday). As is usual practice I’m going to tabulate the data from these stations first, and then, as I generate the graphs, comment. It turns out, however, that the third site in the USHCN set is at First Connecticut Lake, and that turns out to be “nestled in the quiet town of” Pittsburg, NH, so I will use that population, for the table. (It is still only 808 folk). With only a few sites the conclusions are not, were they to stand alone, necessarily that reliable, but they are worth looking into, to see how they fit in with the other states. 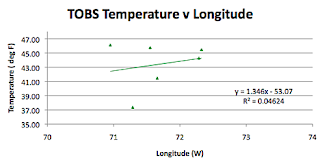 Firstly therefore how does the USHCN data compare with the GISS station. New Hampshire has a mean elevation of 1,000 ft and goes all the way up to Mount Washington at 6,288 ft. The Concord GISS station is at about 400 ft, and there are two of the USHCN stations above the mean. I will show the plots for the TOBS data and comment about the differences with the homogenized USHCN values. The first question is how well does the GISS value reflect the average for the state? Well on average, over the century or more, it is 2.6 degrees higher. There is a very slight increase in the difference over time. 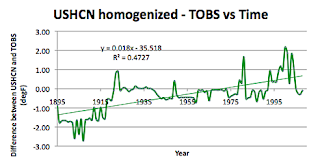 For reasons that will become obvious with the last slide of this post, if the homogenized USHCN data is used, rather than the raw data, then the difference significantly reduces over the time period. 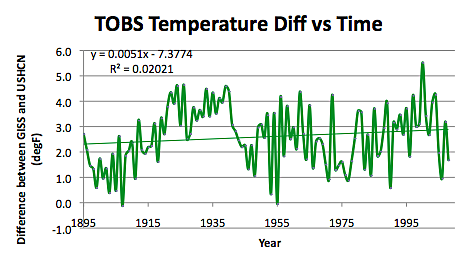 Looking at how temperatures have changed in the state since 1895. 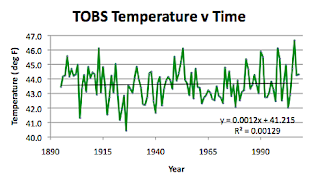 The TOBS data shows a slight increase (0.1 degrees in a hundred years) for the state. The homogenized data shows a rate increase of 1.6 degrees over that same time interval. Turning to the geographical factors controlling temperature in the state, the regression coefficients are helped by the low number of readings. 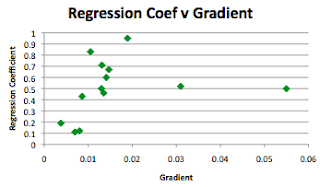 Because of homogenization, the regression coefficient with that data drops to 0.85, and the graph coefficient changes to -4.2. And in this case there is no change in the correlation whether TOBS or homogenized data is used. Looking at elevation, again the small number of stations help the correlation. 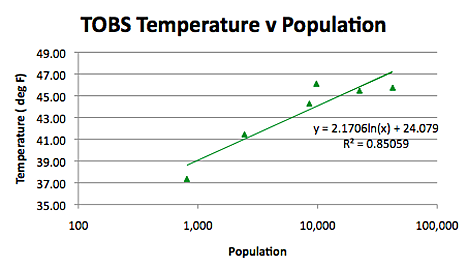 The homogenized result has a slightly lower regression of 0.92. In terms of population, bearing in mind that this is a relatively lowly populated state, the regression is better than usual. 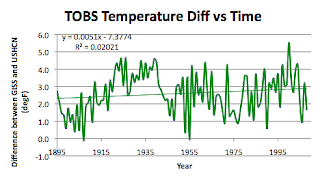 The adjustment over the century is on the order of 1.8 degrees. There are apparently some other problems with some of the USHCN stations but those deal with location, and tie into the population estimation using local light, since we aren’t going that route, I mention it since there may be other problems I have not caught. And for those wondering what all this about, down on the right hand side I list the states I have looked at so far, and the initial place I started with was Missouri, so you might want to look at that state first for more of an explanation. 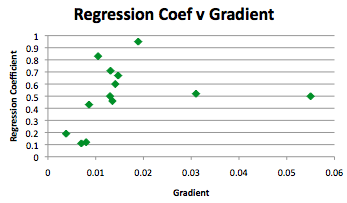 Addendum - Kinuachdrach has asked a question in the comment below and I thought it interesting to plot (for the 13 states I have looked at so far) the value of the regression coefficient as a function of gradient for the temperature elevation plots. Not quite sure what drives the outliers (Illinois and Indiana). 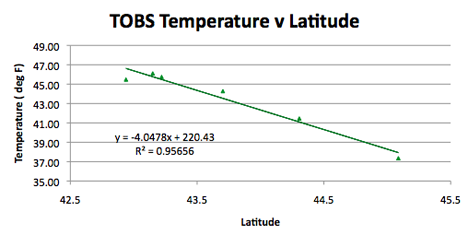 The TOBS temperature versus elevation shows a slope of -0.0189 deg F per meter. (Curse the French!) Which translates to a decline of about 6.2 deg F per thousand feet -- about twice the rule of thumb atmospheric lapse rate in moist air of 3 deg F per thousand feet. 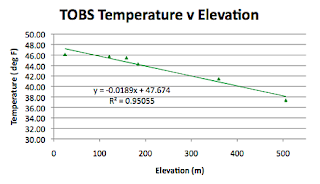 1. other factors in addition to elevation are driving temperature, and the high R-squared value (0.95) is coincidental. 2. data collected over such long periods of time and at such widely separated stations have calibration problems; though again the high R-squared value is a challenge. You are performing a wonderful service here, HO, by actually looking at the data, such as it is. "Settled science" indeed!